Episode Sixty Five: Chris doesn’t watch horror movies, He lives them. Happy Halloween everyone! Our episode is sppooooookkkkeyyy. Except not at all, unless you count Christopher’s harrowing tale of Halloween of 2015. We discuss the announcement that Penny Dreadful will continue on in an upcoming comic book series. You’ll likely recall from a previous podcast episode that we had issues with the series finale, like major issues. We wander into a discussion of violence on television as Chris and Andrew tell Patrick about the new season of The Walking Dead. Christopher sings the praises of a comic book series written by Marjorie Liu and drawn by Sana Takeda called Monstress. He insists Andrew and Patrick read it. We all play more Destiny: Rise of Iron. We report on the goofy fun of Festival of the Lost, wishing there was a little more THERE, there. Trivia is horror movie themed. We are not horror movie people. 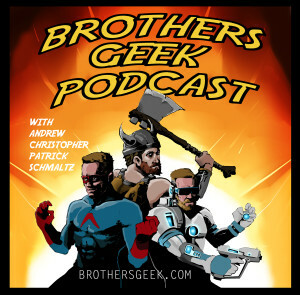 This entry was posted in Podcasts and tagged Destiny, Destiny: Rise fo Iron, The Walking Dead, Westworld on November 3, 2016 by BrothersGeekadmin. Loved listening to you three! Halloween story was epic!